Weddings can turn into big productions. It’s more than just two people committing their lives to one another. 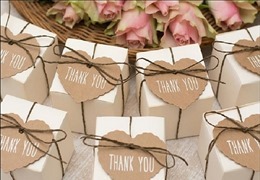 A wedding is a public celebration for friends and family and a way to share the joy with others. In addition to the food, the entertainment is the most crucial part of any wedding reception. People want music and dancing. Check out the attached for some wedding entertainment ideas. Without entertainment, the guests will become easily bored. People loved being entertained. The better the entertainment, the happier your guests will be. Keep in mind that people of various ages will be in attendance, from grandparents to younger co-workers and relatives. The music needs to work for everyone, and that can be a challenge. There are, of course, several options available. You can hire a band or a DJ. A DJ, however, doesn’t play live music, and a band may not fit all venues, That is why hiring a wedding singer may be your best option. In addition to performing, a wedding singer may act as master of ceremony and direct the guests to the next location. Here are the best reasons for you to consider hiring a wedding singer for your wedding. A wedding singer can sing any request, which makes the guests a part of the entertainment. A trained entertainer has the experience to make the event more special and interesting for everyone. He or she knows how to get and keep people’s attention. A DJ cannot provide this type of interaction with the room, nor will he or she have that type of musical training. A wedding singer adds an edge to the celebration. The vocal quality of an expert singer adds another dimension to your reception. A trained singer can set the mood and the tone for your special day. He or she will be adaptable to the moods of guests, varying the music for a hip young crowd to guests who just want a nice, easy slow dance. A wedding singer is able to read an audience and personalize the performance. Imagine your first dance with recorded music. Then, picture that special moment with a live wedding singer, singing directly for you and to you. It’s an entirely different ambiance. Dancing to “your” singer provides an intimacy that no other form of wedding entertainment can live up to. In effect, it’s just the three of you in the room and in the moment. Have the wedding singer record your first song for posterity. Your children and grandchildren will love and treasure it. And you and your spouse can cuddle up on your 25th anniversary to relive the perfect memory. A wedding singer with a guitar can perform at both your ceremony and your reception. 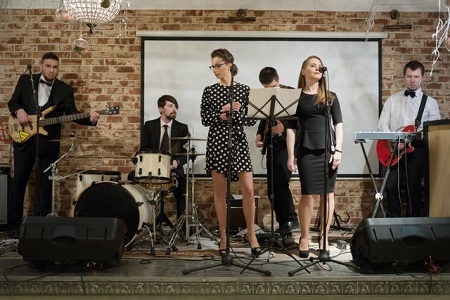 Sure, you want the entertainment at the reception, but a wedding singer can bring an extra element to the ceremony, as well, as he or she performs a special song, with or without a choir in the background. Most religious venues will allow an outside singer. It can transform a solemn ritual into a moment of joy. It is easy for a single wedding singer to move from location to location – from ceremony to drinks to dinner. While people are assembling at any location, he or she can fill the void with the sound of music. First and foremost, the wedding singer needs to be entertaining. You want someone charismatic to keep your guests dancing and amused. While he may be singing that first dance especially for you and your spouse, he should capture the attention of every person in the room throughout the evening. The quality of the singing should be your top consideration. A wedding singer needs to be flexible. He or she should have the skill to sense when a big band song is perfect for the couple’s parents or when a youthful tune can get the kids hopping around the floor before they become bored. This takes a special type of people-skill that comes with experience. Your wedding singer will be a hefty part of your wedding budget, so you want the best bang for your bucks. Besides talent, look for someone who is able and willing to work for a reasonable salary. Perhaps he or she is willing to trade an hour or two of time for meals. Find someone near your venue to eliminate high traveling charges. Be sure to ask about extras, cancellations, etc. Your wedding singer’s personality is a huge factor. He or she needs to be able to liven a stiff crowd, get people laughing and create an irresistible urge to dance. The wedding singer should enhance your day in a memorable way. Along with talent and a winning personality, your wedding singer needs experience in entertaining at weddings and creating a romantic aura. He or she should have a wide selection of romantic ballads at his or her disposal. In addition, he or she should be able to handle a diverse crowd and the problems that can arise at any wedding, such as drunken behavior or arguments. Audition your wedding singer to ensure that he or she sings that way you want them to. Singers have different styles, and you want your wedding singer to be compatible with your wedding. No two singers will sing the same song in the same way. It is helpful if you can attend a performance prior to hiring your wedding singer. You don’t want any unpleasant surprises on your wedding day. Take your wedding singer’s looks into consideration. If your guest list consists mostly of elderly family members or conservative co-workers, a blue-haired funky wedding singer may not fit in. If you have specific song choices that are unfamiliar to your wedding singer, is he or she open to learning new songs? There are plenty of singers, but how do you connect with the wedding singer that is perfect for you? Sometimes, social media can be very helpful. Check out local bands and select the correct band size on the left side. 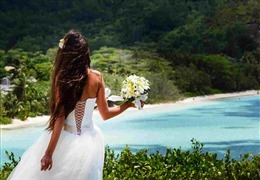 Wedding directories can guide you to the right place. See these wedding entertainment photos for ideas on where to begin your search. Check with friends who have recently been married and ask for referrals. Visit lounges that provide live entertainment. There is a surprising amount of talent out there. Wedding singers frequently take other singing gigs. There are entertainment companies with lists of entertainers to suit all needs. This can save you the time of going to lounges or bars to find your singer. They will provide you with promotional materials featuring their entertainers. This gives you a wide range of people from which to choose. Another advantage of working with an entertainment company is that they will undoubtedly be insured, but be sure to ask. 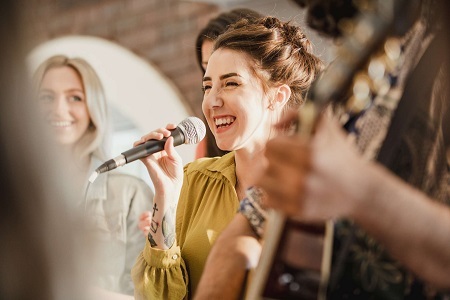 Insurance gives you the peace of mind of knowing that if your particular wedding singer is unable to perform for whatever reason, the company will send a replacement. It may not be your first choice, but it will certainly be better than nothing. Splurging on the right wedding singer will add much to your wedding day. 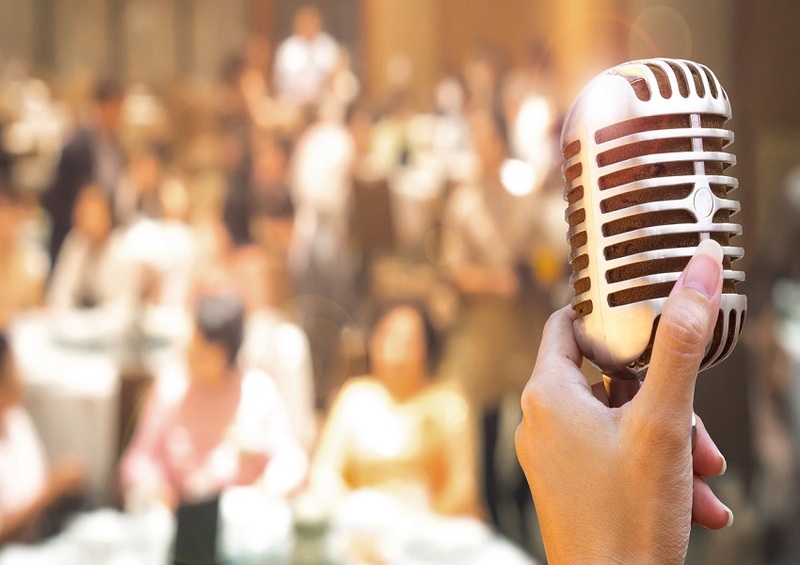 The right singer will create the mood that can turn your wedding reception from humdrum into a memorable experience for everyone.